Tasho is a young woman going to school at CSU Long Beach. She is an English Major, very stupidly double majoring in Creative Writing and in English Education with an emphasis on Creative Writing which keeps her very busy and stressed out. She is an internet junkie, a podcast junkie, and a book junkie. She is loyal, creative, friendly, and outgoing. She loves her mother and her sisters who are her best friends in the whole world. She also loves her writing buddy whose been in her life since eighth grade and with whom she is writing the World's Best Book. And she is an ex-born again bi-sexual pagan with one foot still in the Broom closet...both closets for that matter. 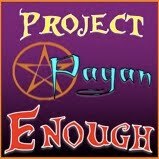 Another Pagan Blog was an idea that came from to many late nights listening to pagan podcasts. After listening to hundreds of pagan interviews where the first question asked seems to always be "How did you come to the path" she felt that she should get her own story out there. For the personal blog she will write about how she came to the path and as time progresses, what her walk on the path is teaching her. She also hopes to have some articles or journals contributed by her friends or anyone who wishes to contribute. Her hope is to have a community pagan blog, or perhaps a sort of e-zine might be a better way of putting it. She wants to get something out there for the younger generation of pagans to write for one another. And she wants to have a page or a blog dedicated to the Campus Coven that she and two of her friends are trying to set up, the progress, meetings, events, and etc., and hopes that this will inspire other pagans to organize a similar club. In other words, she has a lot of high aspirations. Please send some productive energy her way once in awhile, to remind her to get off Lord of the Rings Online and post!